Trouble fitting panel to dowels. 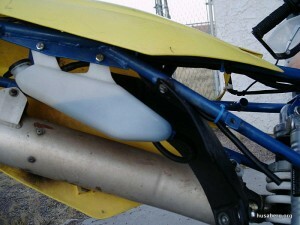 Create new holes on the back of panels under seat. Then adjust slightly. Rusty and haggard. Don’t worry, not a problem. It’ll go on like this forever. A simple little mod is to make a small hollow in the front face of the lever that will fit onto the plastic ‘stop’ and keep it there. Leaking. Can use Kayaba; machine the outer leg from 58 to 59mm. Never leak! Drips down front of engine. 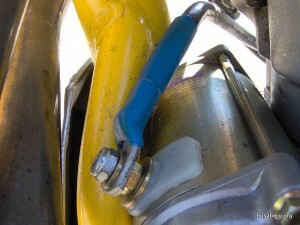 May have over-tightened the breather clip and torn the rubber tube (Simon). 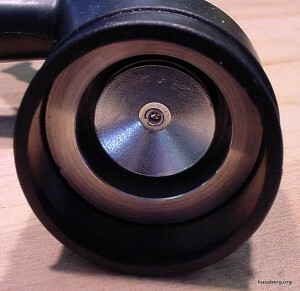 “O” rings on black plastic rocker spindle caps. 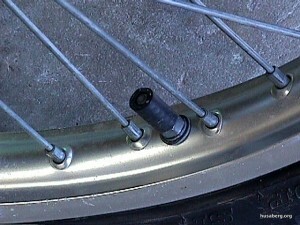 Also centre screws-thread lock in. 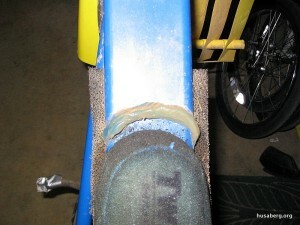 Change rocker gaskets once per year. 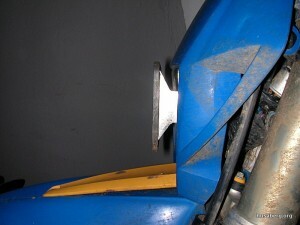 The dowel that the breather pipe is connected too comes loose (Simon). Try new “O” rings on the cam end cap, different silicones. I found both the rocker cover and the top of the head had warped. Use a pane of glass, P600 wet n dry, bulldog clips, 1/4 turn every 6-7 strokes. It works! If using same headgasket again… May try torqueing down to 60 Nm – 15 Nm above factory numbers (became the standard torque setting from 2004 onwards). Circlip groove on end of shaft. 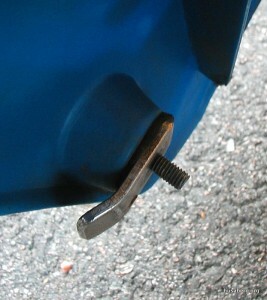 The groove for the circlip is too shallow and will end up in the sump. 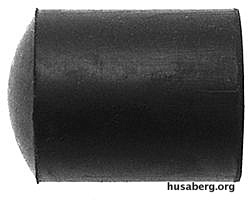 Possibly the Reed valve. Broken/damaged/blocked reed valve situated below timing gears. Try Evans Coolant. Very successful – even at altitude. Pure water is still the best conveyor of heat though but boils too soon. 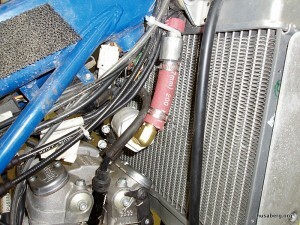 Remember that the coolant should only just cover the tubes so don’t overfill. Radiator caps sometimes don’t seal correctly. Coolant may be seen leaking from the water pump housing. 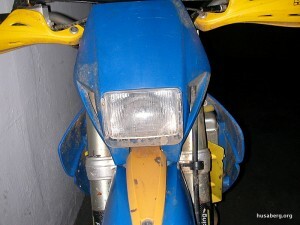 Start the bike up and let it idle whilst looking for tell-tale signs. 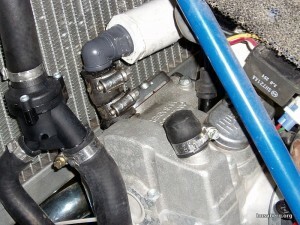 Remove the spark plug and check the top of the piston and also remove the cap and look at the coolant for bubbles. This represents the head gasket has gone (Lineaweaver). Check the look of the oil through the sight glass: this will go ‘cappuccino’ in color. If after a rebuild: did you renew and silicon in the three ‘O’ rings around the barrel? Common in the early models. Use a later model gear selector fork and it’s cured. Another great idea from mikst – A stripe of a tube or an O-ring is suitable material for the stripe. Remove the stripe and pull out the spoiler to make the tank free. The plate has threads to lock the screw in the spoiler. No threads in the bracket pin radiator protection. The free wheel mechanism (clutch) that was introduced mid 2002 is built into the starter reduction gear set which was previously a solid machined gear assembly. 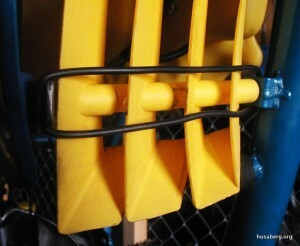 It’s recommended to fit this to earlier machines to prevent gear/sprague breakage if kick back occurs. 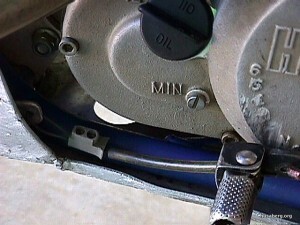 As far as the Sprague assembly itself, the large outer gear/hub is the same 2001-2003, the sprague is the same 2001-2003, but the inner small gear/hub is different mid 2002. Why? The gear teeth pitch was changed mid 2002 on the counter balancer, inner counter balancer drive shaft gear , outer balancer drive shaft gear, primary gear, and outer clutch basket gear. Mix 2001 and 2003 gears and it’s very noisy. The noise usually happens when an 2003 counter balancer is installed in a 2001. It would have been nice if one could simply change the balancer drive shaft with it’s machined-on inner gear to an 2003 assembly, but the 2001 outer balancer shaft drive gear will not fit the 2003 drive shaft. Install the outer 2003 balancer drive shaft gear and you also need to change the primary gear. 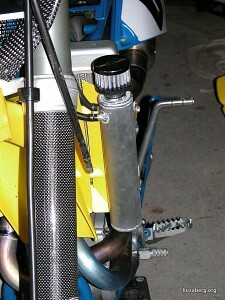 clutch basket, and the inner starter sprague gear. Paranoid types will start thinking ‘conspiracy theories’ at this point. 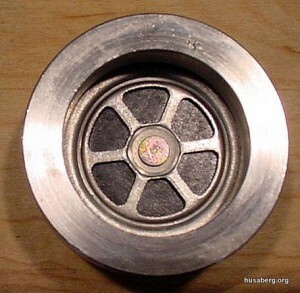 (Actually they make a special double bearing balancer with the 2001 gear pitch.) All this info is because if your 2001 hasn’t been updated, it can’t be the freewheel mechanism that is slipping because you don’t have one. Probably the sprague is slipping. They are quite delicate and small amounts of wear on the inner gears hub or the outer gears hub will make the sprague itself slip. 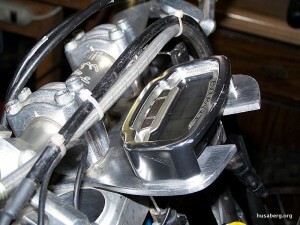 Remember that the outer hub is the same 2001-2003 but the inner is different (dsducati). Two gaskets. A bit softer on the screws but stops leaks. Use NAPA Auto Parts Number 60-1696 5/8″ 1.5cm radiator heater hose bypass cap. Two come in a pack (husabutt). 1.5cm radiator heater hose bypass cap. Metal material opposed to paper. Life use is up to you! Clean and go again. 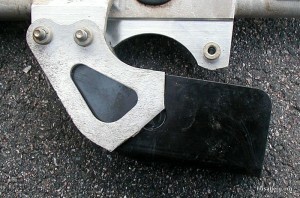 Clutch lever locates to hand. Remove indicator part of switch underneath (2 screws). Rotate and lock wire them on. Enlarged by 2mm in diameter. Found I couldn’t adjust the lever low enough for my style. Ok now. Sitting on clutch cover and cases. Need to “oval” centre pipe slightly with a gentle tap. Brakes lack initial bite. Tried EBC, tried Apico, settled for ‘Gold’ sintered pads. Lineaweaver has made this neat unit to fit in your nasal passage! Bobzilla made a crank vent. PVC coupling with coarse foam inside and rear vent blocked off. Run to the right so when you’re left side down, the oil has to go higher in order to escape. Can have misfire. Silicon the lead into both the coil and the plug cap. Splits easily, oil in carb if inverted. 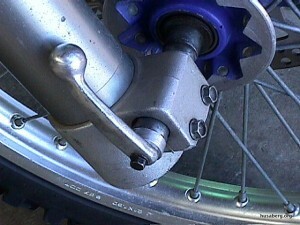 Fit Yam WR4 breather and feed down onto front sprocket or below… Re-route to get cleaner air to carb. Block underside of frame, a NAPA Auto Parts 5/8″ (1.5 cm) radiator heater hose Bypass Cap PN 660-1696 is a perfect fit, point a 6′ hose up, and fit a K&N filter. Or fit an air pump check valve (Chrysler Part No. 04300376 – Cost is about $30.00). They can leak. 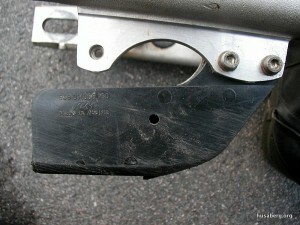 Fit two thinner seals for insurance. Ask your bearing stockist! Find TDC using “dead-stop” method. Warning: 8d out on my bike. If you have trouble getting the new gearing to work, you can turn the adjuster blocks the other way round and bring the wheel further forward. Over 48T, the lower chain guide is too close. There is room to pivot the guide down at the front and re-drill at the rear for a lower hanging chain guide. Rotate it forward one spline. This gives a longer, deeper kick and helps starting a great deal. Remove slack so engine spins fast. Modify the crescent. Add a washer or two beneath the seat bolt head, as the threads protrude into the dirt underneath and after some use will wear out the threads. Space it properly so that no threads protrude.